Here are a couple of watercolor sketches I did yesterday as I take a short break from the pin-up project. 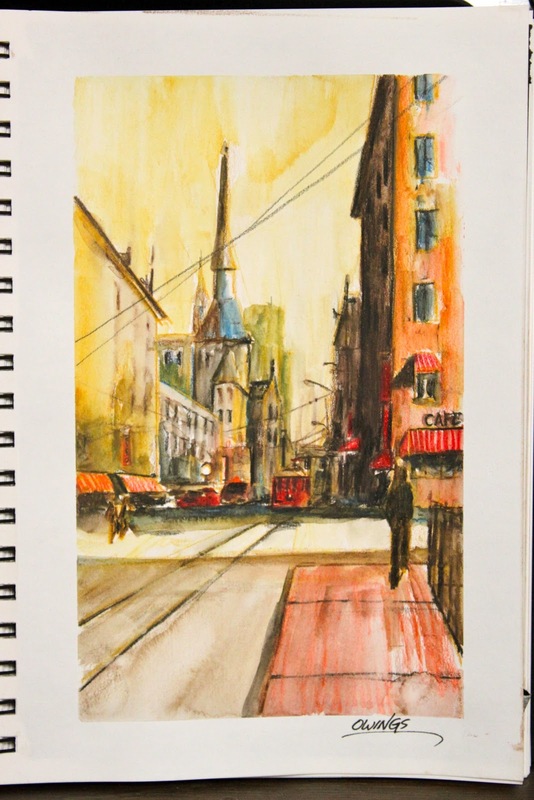 Both of these are very quick sketches of street scenes that took about 15 - 20 minutes each. I used Faber-Castell and Derwent watercolor pencils for these. I like both kinds of pencils for different reasons. The Dewrent pencils are very smooth and have a buttery feel to them as they lay down on the paper. The Faber-Castell pencils are slightly harder, but have deeper color to my eye and may have better lightfastness if you're concerned about longevity. For my purposes I like the idea of knocking out quick sketches. Working fast forces you to make decisions about composition, lighting and shadow that you might otherwise agonize over. 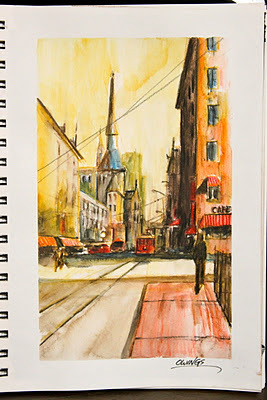 Using watercolor or water-soluable pencils really opens up interesting possibilities for an artist. For instance you can block in your composition and colors, paint and then add in detail. I'll admit that I was never a big fan of working in watercolor, mostly because it seemed so uncontrollable to me. The water seemed to go everywhere and colors just ran into eachother. No matter how precise I tried to be, the watercolor and paper would mix in strange or unfamiliar ways that seemed disconcerting to the eye. I was definitely uneasy with this medium. By using watercolor pencils, and the control they offer, I've overcome that uneasiness. Art is filled with mystery and by that I don't mean the mystery of the art itself, but the mystery and secrets surrounding the techniques used to create art. I suppose to some people that's a good thing, but to me it's always been a source of frustration. Unlocking the techniques to draw or paint better is something you have to work quite hard at or pay lot's of money to attend school for. For instance if you want to know how to change the alternator in a 91' Toyota Camry there is a You Tube for that. 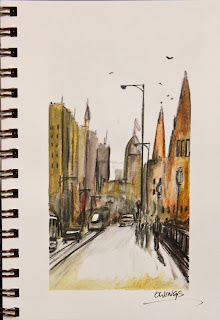 If you want to know how to capture a reflection on a street using watercolor, well, good luck. Guessing at why such knowledge is not widely shared is pure speculation on my part, so please take the following as such. I know that the art world can be extremely competitive and I'm not naive enough to think that some secrets aren't well guarded, but in my view that is unfortunate. I don't think sharing what you know lessens the value of your work. And even though I may have little to offer the wider art world, just for fun I'm thinking of putting together a series of short videos that demonstrate some of the techniques I've learned over time. Stay tuned.